Peter Houston saw his side blow a comfortable lead and let two points out of their grasp. Pic by Michael Gillen. Falkirk failed to see off a haphazard St Mirren side and took one point when a win was well within grasp. The Bairns were in complete control of this game but allowed a late blast from Tom Walsh to salvage a draw for the SPFL Championship bottom side in the televised early evening kick-off. The Bairns had the lead from as early as the ninth minute as Craig Sibbald swept in a free-kick which deceived Jamie Langfield by a deflection off Lewis Morgan in the Saints wall. That really knocked the wind from the Saints who had started brightly and pressured Danny Rogers’ goal as early as they could, but unlike his early slip here, the keeper was content taking all crosses even with the strong sunlight in Paisley. Link-up play was pulling the Saints apart and the white-shirted Buddies looked an accurate reflection of their league placing and, Stevie Mallan aside, looked like they’d rather be anywhere else but the football pitch of an early Saturday evening. Rogers raced out to gather. fully in the face and required medical assistance from Saints doctor David Wong. However Saints should have levelled when Hardie blazed over from the penalty spot after MacKenzie knocked down a Mallan free-kick at the backpost. The sides went in with Sibbald’s strike separating them. Falkirk’sfirst half had been predominantly very good, and the Bairns’ control of the game was never in doubt from the goal onwards. 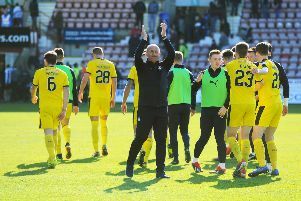 In truth the barely had to get out of second-gear to see off the Saints’ threat, but they did more than that to impress boss Peter Houston after disappointing him with last week’s victory against Ayr. shot broke to Bob McHughafter more brilliant Bairns build-up, and though the striker stroked the ball into the net, he was denied a goal by the linesman’s offside flag. picked up a knock and McHugh had run himself ragged up front and both were replaced midway through the second half by Lee Miller and James Craigen. Bairns were at risk of blowing their chance for a sixth successive victory and relied on Rogers to make a brave stop low to stop Hardie equalising. From the reluctance of the first half the Saints were just a goal away from salvaging something from the game, and lifted their performance with Tom Walsh and David Clarkson coming off the bench for the Buddies. cross which Langfield kicked off the line on 80 minutes. tipped round the post on the stroke of the 90th minute. It’s a sixth game undefeated for Falkirk, but it really should be the joy of six wins on the bounce.